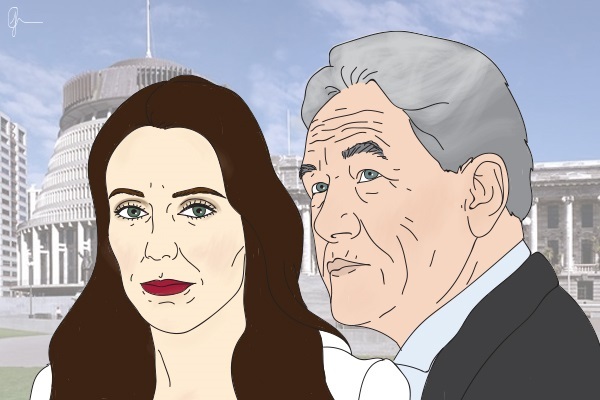 Jacinda Ardern & Winston Peters cartoon by Jacky Carpenter. Almost 20 years ago, New Zealand's first MMP Coalition Government collapsed. It was not a dramatic implosion on a major point of principle, but was provoked by a comparatively minor issue - a proposal to sell the Government's shares in Wellington Airport - and came after a series of disagreements between the Coalition partners on various aspects of policy. There has been speculation this week in the wake of New Zealand First's hanging out to dry of the Justice Minister over the proposed repeal of the "three strikes" law that the same process might be starting all over again. While it is far too soon to draw conclusive parallels, the 1998 experience does set out some road marks to watch out for. Immediately after the formation of the 1996-98 Coalition, New Zealand First's standing in the opinion polls slumped to the point where one senior National MP at the time famously described them as "dog tucker", and where National MPs became genuinely concerned that their Party and leadership were conceding too much (perhaps "over a whiskey bottle") which was consequently threatening their own future electoral prospects. There is already speculation that the current Coalition Government is being dominated by the whims of New Zealand First, which has similarly crashed in the polls, although that talk seems limited to the media commentariat at this stage. No Labour MPs have yet broken ranks to make that complaint, but a long winter and some tough decisions lie ahead, which may yet provoke that. During 1996-98, there had been a series of public differences between National and New Zealand First Ministers on a range of issues. So far, this time, the spat over "three strikes" has been the most obvious, but the seemingly general poor communication between Ministers there has been so much of suggests the "three strikes" debacle will not be the last we see of this type. The third prong of the 1996-98 era was a mounting public concern that the tail was wagging the Coalition dog, and that the National Party was not standing up sufficiently strongly to that. There is no real evidence of that feeling emerging at present, although the next few weeks when the New Zealand First leader is Acting Prime Minister could change that. One factor present in the current situation which was not there in 1996-98, and which makes the Government potentially more vulnerable, is that this Coalition does not have a majority in Parliament. It has to rely on the Greens as a confidence and supply partner to achieve that. There had been hopes that the Greens might be the conscience and moral backbone of the Government, but so far the allure of power for the first time has supplanted that, and they cannot be expected any more to do anything to put that at risk. All of which brings us back to the dynamic between Labour and New Zealand First, and the Prime Minister and her Deputy in particular, determining the fate of this Coalition. At the moment, the Prime Minister's authority is unquestioned, but generally unexercised so far. If there comes a time when that perception changes and the Prime Minister, either through circumstances or her own inaction, comes to be seen as weak and in the thrall of her Deputy, then the pressure on the Coalition will intensify. As the 1998 Coalition collapse shows, a combination of circumstances came together to the point where a relatively small issue triggered the demise. Although similar circumstances exist at present, they do not yet show any sign of coming together in such a way to engineer a repeat of 1998. Nevertheless, each of them has the capacity to be the thread that starts the unravelling process. While a dramatic explosion is unlikely, the durability of the Coalition cannot yet be taken for granted. The New Zealand First leader is beginning to display all over again the same traits that saw him sacked from the Cabinet in 1991; sacked as Deputy Prime Minister in 1998; and, suspended as a Minister in 2008, suggesting leopards really cannot change their spots. In which case, the next 12 months have suddenly become much more interesting. *Peter Dunne is the former leader of UnitedFuture, an ex-Labour Party MP, and a former cabinet minister. This article first ran here  and is used with permission.